Temporarily relieves cold symptoms such as sneezing, runny nose, and nasal congestion. Children 6 months of age and older: Snap off one single-use dose. Twist to open. Squeeze entire contents into mouth. Administer one liquid unit-dose at the onset of symptoms, 3 to 6 times a day. Reduce with improvement. Keep the remaining unit-doses in the aluminum pouch. Homeopathic Pharmacopœia of the United States. Ask a doctor before use in children under 6 months of age. Stop use and ask a doctor if sore throat, vomiting, skin rash, diarrhea, difficulty breathing or fever above 100° F (38°C) develops, or if symptoms persist for more than 2 days or worsen. After administering, discard single-unit container. Do not reuse. Do not use if glued carton end flaps, inner foil pouch, and single-use container are not intact. Before opening the foil pack: No specific storage conditions. After opening the foil pack: Store the unused doses in the foil pack at a temperature that does not exceed 77°F (25°C). After opening the unit-dose: The product must be used immediately. 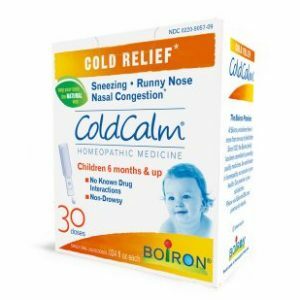 ColdCalm Liquid Doses are available in a box of 30 single-use liquid doses.